All rope made in the U.S.A.! This rope is used to wrap nosebands on our diamond braid products. 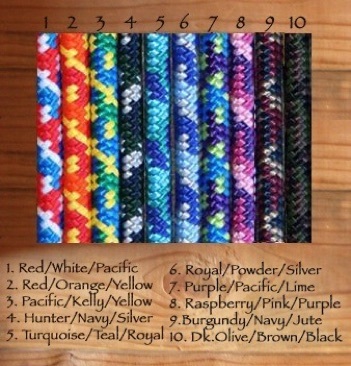 Our key chains, and bracelets are also used for this rope. 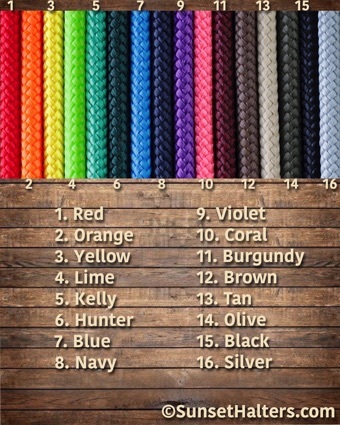 This rope is used for wrapped nosebands on our halter cord and yacht braid ropes. 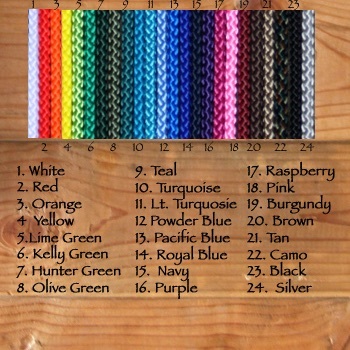 We also use this rope for bracelets and key chains. This rope is used for halters and rear view mirror mini halters. 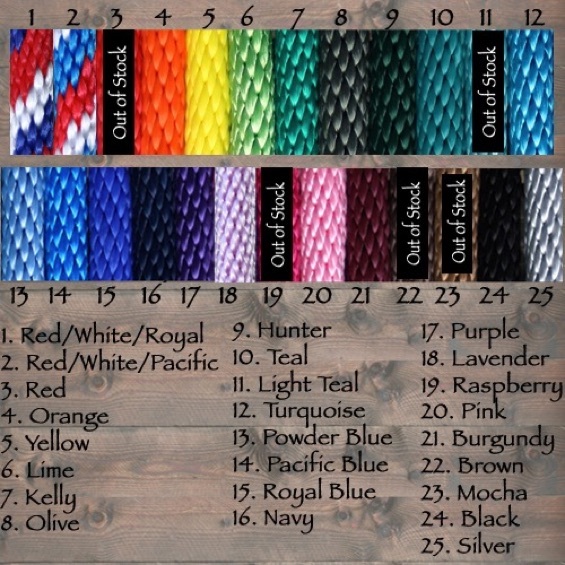 This rope is used for halters, halter/bridles, sidepulls, haltermores, quick catch halters, training strings, and dog leashes. It matches our 1/2" yacht braid perfectly. This chart shows the colors available for the 1/4" halter cord. The halter cord rope is used for Hope Rope Halters™, halter/bridles, sidepulls, haltermores, and neck ropes. This rope matches our 1/2" yacht braid perfectly. This rope has been custom made for us here in the U.S.A. 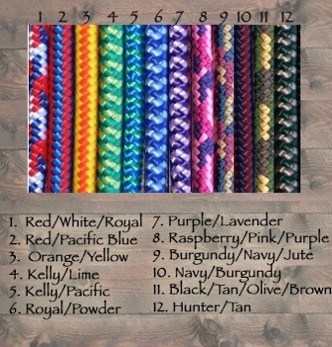 It can be used for halters, sidepulls, halter/bridles, dog collars, leashes, and haltermores! This rope matches our 5/8" derby rope. This rope is also custom made for us here in the USA. We use this rope for halters, sidepulls, halter bridle combos, and haltermores. 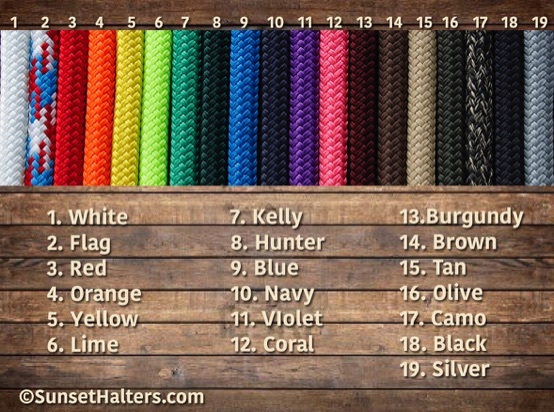 This chart shows our current colors in 5/8" derby rope. 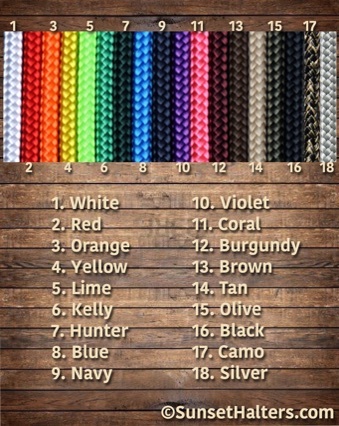 Our derby rope is made by the same manufacturer as most of our 1/14" and 5/16" diamond braid for a perfect match! This a great economy rope, and is available for our lead ropes, lunge lines, roping, split, and mecate reins. This rope is made right here In Washington State. We make roping, split and mecate reins out of it, as well as leads and lunge lines. 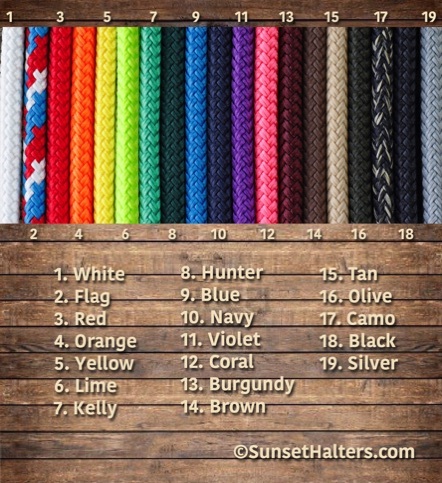 This rope matches our 1/4" yacht braid, 1/4" halter cords and 5mm accessory cords perfectly.